Cedar Point is often considered to be mecca for coaster enthusiasts, being home to seventeen roller coasters mixed in with a substantial collection of flat rides. Having not been to the park for seven years I decided that it would be worth trying as many of the coasters as possible to figure out where they rank for me now. I began my morning on Millennium Force, which is still the best giga coaster out there a full decade after its construction, and a much more fun experience than the latest challenger. Cedar Point's ride may have a relatively uninspired layout, but it manages a sensation of speed that is absent in the Japanese contender with smooth direction changes that the train negotiates with ease. It's not a top ten coaster for me any more, but it definitely remains in my top ten percent. The new credit for me today was Maverick (#1510), a ride which I'd really like to list in my top five. 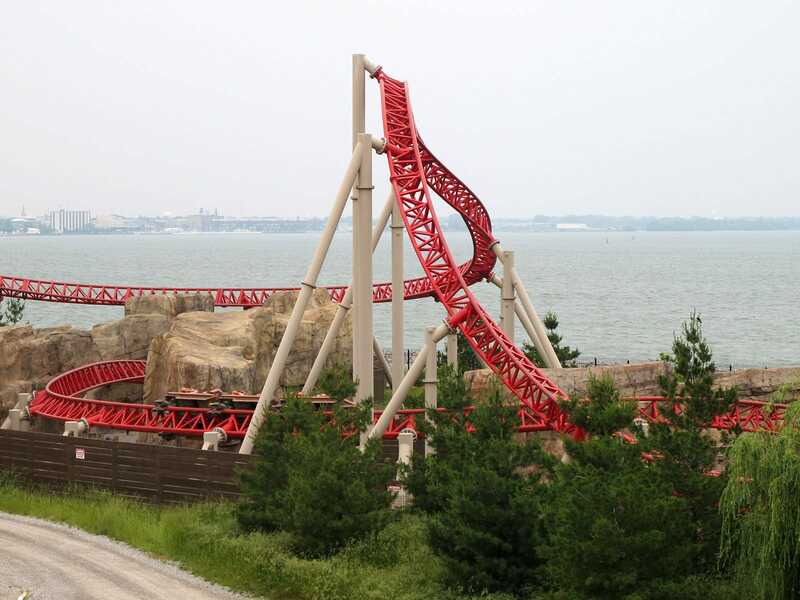 It has a superb layout, with a beyond vertical first drop, several wickedly intense direction changes, two inversions, and a superb enclosed launch section that comes as a mid course surprise for unsuspecting riders. Unfortunately, at the risk of sounding like a stuck record, this ride is marred by the horrendous Intamin OTSR design that on this occasion managed to catch my neck twice mid course. This problem can be eliminated with defensive riding, but this isn't something I feel one should have to do to enjoy a coaster. I'd been waiting for Top Thrill Dragster for twenty minutes when the clouds began to darken. One flash of lightning later and the ride was closed. Rather than get drenched by the expected rain storm I elected to leave the queue for the sanctuary of a nearby restaurant, and just in time; the heavens opened in spectacular fashion, closing every ride in the park. It took around twenty minutes for the skies to clear, but Top Thrill Dragster remained down, as it cannot be operated in any form of precipitation; even the lightest form of rain is enough to shut the ride down. Rather than hang around, I walked directly into the back row of Wicked Twister. The ride had a distinct rattle to it today that I don't remember from before, but it was still superb. From there I headed over to Raptor, which continued to operate even as the rain came back. I waited for the better part of an hour, and had just made it into the station when two things happened almost simultaneously; the rain stopped, and the ride went down due to weather conditions. With apologies to Cedar Point, how is it that a ride can run in the rain, but then close down when the sun comes out? Ten minutes later with no visible changes the ride reopened. The experience was just as intense as I remembered, a masterpiece of old-school B&M. Blue Streak was a walk-on, probably because only really determined guests can find the carefully hidden entrance. Those that do find where they're going (presumably using a GPS) are rewarded with an average out and back wood coaster, nothing outstanding, but a pleasant way to pass a few minutes. Similarly hidden away is Disaster Transport, an enclosed bobsled coaster in the dark which proved surprisingly thrilling. The theming of the ride is a little (okay, very) dated, but this doesn't hurt the overall experience. My final coaster of the day turned out to be the only one that I really regretted. Corkscrew was not running well, with some particularly nasty bumps compounded by a seat which just didn't have room for me. This ride might have been thrilling in 1976, but at this point it's well past its prime and worthy of nothing more than the scrap heap. As I walked back towards the resort hotel I spotted a short queue for Top Thrill Dragster. This time I made it all the way out to the launch track before the ride closed down due to high winds. An operator told me that the wind speed at the apex must be below thirty-five miles per hour in order for the launch mechanism to fire, and this speed was being exceeded. I gave it half an hour and eventually gave up. I heard later on that the ride did not reopen all day, which must have been particularly irritating for those who continued to wait in line.